It is known that in case of nonsalient pole type alternators the air gap is uniform. Due to uniform air gap, the field flux as well as armature flux very sinusoidally in the air gap. In nonsalient rotor alternators, air gap length is constant and reactance is also constant. Due to this the m.m.f.s of armature and field act upon the same magnetic circuit all the time hence can be added vectorially. But in salient pole type alternators the length of the air gap varies and the reluctance also varies. Hence the armature flux and field flux cannot vary sinusoidally in the air gap. 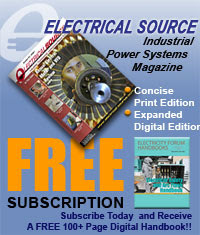 The reluctances of the magnetic circuits on which m.m.fs act are different in case of salient pole alternators. Hence the armature and field m.m.f.s cannot be treated in a simple way as they can be in a nonsalient pole alternators. The theory which gives the method of analysis of the distributing effects caused by salient pole construction is called two reaction theory. Professor Andre Blondel has put forward the two reaction theory. 2. 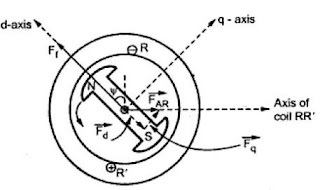 Component acting at right angles to the pole axis called quadrature axis. The component acting along direct axis can be magnetising or demagnetising. 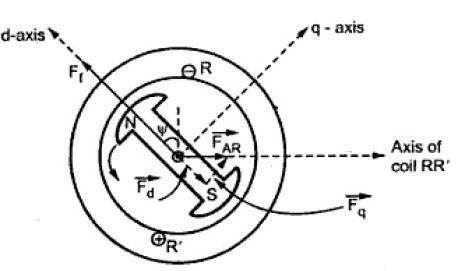 The component acting along quadrature axis is cross magnetising. These components produces the effects of different kinds. The Fig. 1 shows the stator m.m.f. 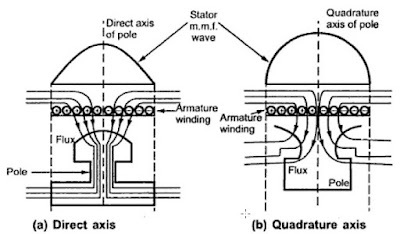 wave and the flux distribution in the air gap along direct axis and quadrature axis of the pole. The relucatnce offered to the m.m.f. wave is lowest when it is aligned with the field pole axis. This axis is called direct axis of pole i.e. d-axis. The relucatnce offered is highest when the m.m.f. 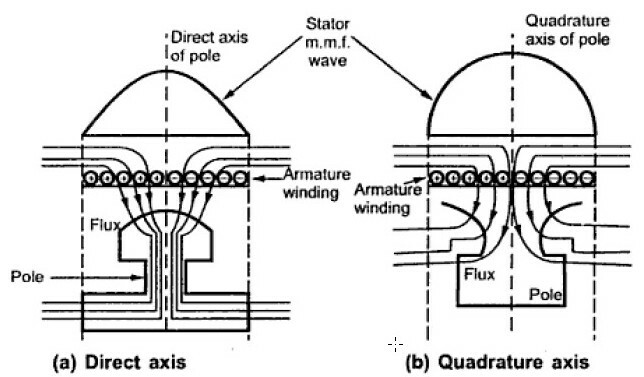 wave is oriented at 90 to the field pole axis which is called quadrature axis i.e. q-axis. The air gap is least in the centre of the poles and progressively increases on moving away from the centre. Due to such shape of the pole-shoes, the field winding wound on salient poles produces the m.m.f. wave which is nearly sinusoidal and it always acts along the pole axis which is direct axis. Let Ff be the m.m.f. wave produced by field winding, then it always acts along the direct axis. This m.m.f. is responsible to produce an excitation e.m.f. Ef which lags Ff by an angle 90o . The positions of FAR, Fd and Fq in space are shown in the Fig. 2. The instant chosen to show these positions is such that the current in phase R is maximum positive and is lagging Ef by angle Ψ. The phasor diagram corresponding to the positions considered is shown in the Fig. 3. 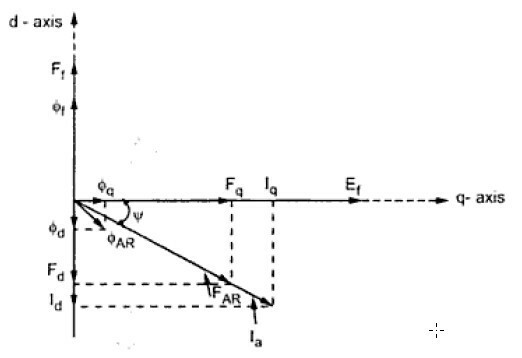 The Ia lags Ef by angle Ψ. 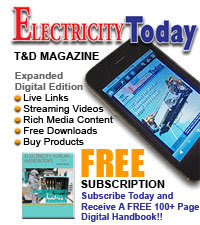 It can be observed that Fd is produced by Id which is at 90o to Ef while Fq is produced by Iq which is in phase with Ef . The flux components of ΦAR which are Φd and Φq along the direct and quadrature axis respectively are also shown in the Fig.3. It can be denoted that the reactance offered to flux along direct axis is less than the reactance offered to flux along quadrature axis. Due to this, the flux ΦAR is no longer along FAR or Ia. Depending upon the reluctances offered along the direct and quadrature axis, the flux ΦAR lags behind Ia.